How do I cite a magazine cover in my works-cited list and in my essay? The most recent issue of The Nation features on its cover an image of a donkey with the top of the Capitol building on its back. The Nation. 17-24 Dec. 2018, www.thenation.com/issue/december-17-24-2018-issue/. If you discuss a cover image in detail and wish to credit the artist, you could provide the artist’s full name at first mention in your prose or the artist’s last name in parentheses and list the entry under the artist’s name. 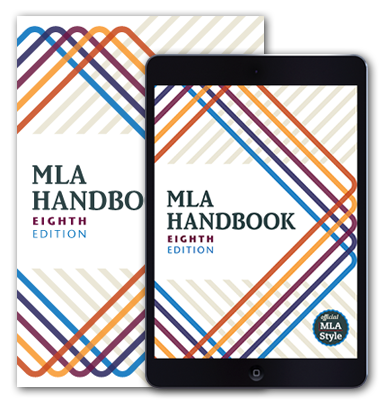 How do I cite the works-cited quick guide from The MLA Style Center? “Works Cited: A Quick Guide.” The MLA Style Center, Modern Language Association of America, 2018, style.mla.org/works-cited-a-quick-guide/. If you are citing individual Web pages from the guide, create a works-cited-list entry for each page that you cite. Since each page has the same title, you might use the page header as the title of the source, followed by the title of the Web site as the title of the container. How should I cite a theme park attraction? A theme park attraction does not generally require a citation, but if you need to create one, follow our guidelines for citing a building. Should names of apps and other software programs be italicized in MLA style? Yes. Titles of software programs, including apps (e.g., Kindle, Instagram, and Facebook), are italicized in MLA style. How should I cite an article from a journal that uses article numbers and starts pagination anew for each article? Omit the article number and page numbers, as shown in the example below, because the name of the author and the title of the journal are sufficient to lead your reader to the article. How do I format a recommended reading list in MLA style? Format a list of recommended works just as you would a list of works cited. Give the list a header that indicates its purpose (e.g., List of Recommended Readings). If you want to add commentary about the works being recommended, append it to the end of each entry, just as you would for an annotated bibliography. How do I cite a phrase from a poem quoted in the published version of a speech? To cite a poem quoted in the published version of a speech, create a works-cited-list entry for the speech since it is your source. You can provide relevant details about the poem being quoted in your prose or in a note. How do I cite a photo or other image reproduced in a Web site article? A recent article summarizing a study of Leonardo da Vinci’s Mona Lisa shows a scan of the original Mona Lisa so that readers can judge for themselves whether or not the woman in the painting is smiling (Daley). How do I cite a Google Earth location? To cite a Google Earth location, follow the MLA format template. Provide a description in place of a title. Then list Google Earth as the title of the container and the URL as the location. In the following example, the URL has been shortened, in accordance with our URL guidelines. Map showing location of Leaning Tower of Pisa. Google Earth, earth.google.com/web/. Read more about citing maps.